Have you ever heard of the term “torpedo stocks”? If you’re currently saving for retirement by buying stocks, this is a term that you should definitely be familiar with. In my last article on Modest Money, I discussed the pitfalls of index fund investing. In my view, index funds are likely to lead to pain, rather than a comfy lifestyle in retirement. That’s contrarian thinking sparked by incredibly high market levels entering 2018. But I also mentioned a second path to retirement bliss, one that’s much more likely to work out if you are prepared to put just a little bit of time and effort into your portfolio — deep value investing. In my view, most people who are selecting stocks for their retirement are doing it wrong. Most investors are picking “good companies,” stocks that have gone up a lot in the past, stocks of companies that are soon to release higher earnings, or stocks that have been selected because the technicals look good. All of these make for lousy long term investments. Take “good companies,” for example. I remember once discussing investing with someone on a Google forum years ago. He was bragging about how he bought Coca-Cola and how great of a company it was. He had held it for 10 years which, at the time, meant he bought it in 1998 or 1999. Looking at the chart it was easy to see that the company’s stock price had dropped meaningfully since then and had only crept back to and passed his breakeven cost 10 years later. He had made a compound annual 3%. That performance will not make for a great retirement. The problem wasn’t the company, it was the valuation. 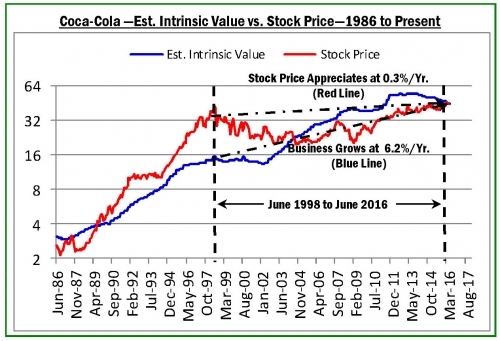 Coke was widely regarded as one of the world’s best companies but it was trading at an enormously high PE of 61x. Put another way, if you bought the entire company it would have taken you 61 years to earn your money back on the investment. Valuation is key when it comes to investing. And, while the above scenario is bad, torpedo stocks are even worse. A torpedo stock is a rapidly growing stock that ends up devastating investors. These stocks always have a very positive consensus view leading up to the devastation — both pundits and investors think the stock and the company are going to keep on growing rapidly. But, some hiccup in earnings or negative event occurs that disrupts that growth trajectory, leading to a massive drop in price. Take a look at Taser International (now Axion) in 2004. The company had come out with a great new less-lethal product, the taser, and had secured some big contracts with law enforcement departments around the US. The stock, which had grown rapidly in the years prior, surged up to $31.65. Investors who bought the previous year were swimming in money. But, the company hit a snag due to poor publicity and serious questions about its product. Investor were no longer willing to give the company its enormous valuation, and the stock crashed to $8.61 a year later. Investors who bought at the peak when times were good and predictions enthusiastic lost -73% of their money. Investors who bought the year before even lost money. Are Netflix investors going to suffer the same fate? The future is always uncertain, so it does not make sense to pay up today for tomorrow’s assumed growth. Instead, investors really need to protect themselves from unforeseen negative events. Ironically, there’s one technique that both protects investors against losing money, and sets them up for great long term performance: value investing. Value investing is based on three premises: the underlying value and the price of a stock are two different things, over time the price of a stock will trade around its underlying value, and nobody can tell what the future holds with any certainty. In order to protect against unforeseen negative events, investors buy undervalued stocks and then wait for the price to rise to reflect value. Unless the underlying value deteriorates significantly, an investor is protected against negative outcomes. The value of a stock is typically grounded in the amount of earnings or net assets the share represents. If a a company has a book value per share of $10, and the stock is trading at $7, we have a bargain. If it’s trading at $700, it’s likely overvalued. In terms of earnings, if the price of the stock is $7 and the company is earning $1 per share, the company is trading at a price to earnings (PE) of 7x. If the market as a whole is trading at a PE of 10x, we may have a significant bargain on our hands. It’s worth noting here that most of the best investors — those with the best long term track records in terms of CAGR — are value investors. They’re constantly buying stocks for much less than they’re worth. It’s also easy for individuals to get into. But, while I love value investing, there’s a variant of value investing that produces the best returns on offer to small investors such as you and me: deep value investing. 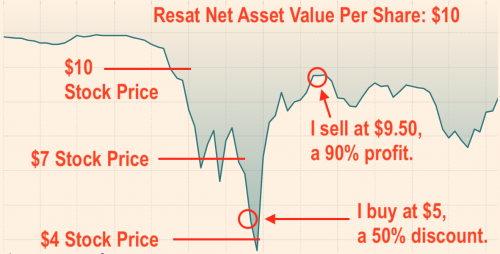 Deep value investing essentially demands a very large discount to a stock’s underlying value, and uses more conservative tactics to estimate a stock’s value. Rather the 30% discount cited above, I look for firms with a 50% discount or more. This means greater protection against unforeseen events, since a stock’s value has to deteriorate more before your purchase price is impaired. Conversely, my upside is larger, since the price has to rise more before getting back to the stock’s fair value. The catch is that you have to have a strong stomach to buy these firms because most of them are lousy businesses. Others have serious business problems, so investors have dumped the stock. While you may be rightfully cautious about buying firms that have major business problems, if you select using simple yet high quality criteria and diversify well, your portfolio will produce great long term returns. Let’s take another look at Taser International but this time flip the chart on its head to see how I usually pick a stock. We’ll call this company Resat the electric fly swatter company. In the image below, the company is not doing very well and the stock performance reflects this. Then, reports come out about its fly swatters being strong enough to zap cats and the firm has to issue a recall. The stock takes a major dive. But, the problem is known, easily solved (by reducing the current running through the swatter) and the company should be able to get back on track soon. Let’s take a look at the investment opportunity. As expected, the company was soon able to solve its problem and the stock bounced back to just under its pre-crisis price. Buying at $5 meant a 90% profit in just under a year. 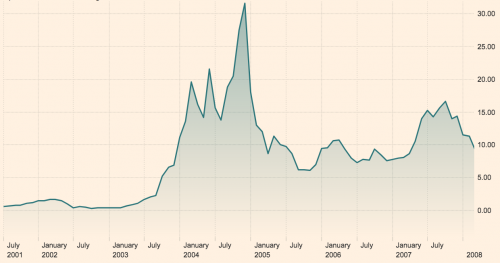 This is more than double the profit that Coke investor mentioned above earned over a decade. How often do these sort of events happen? Quite frequently. With 10s of thousands of publicly listed stocks, there’s always some crisis unfolding. How do you know the negative event won’t ruin the company? It’s usually pretty obvious but a company does not have to recover businesswise for the stock to bounce back. That’s one of the great things about buying deep value stocks. So long as you conservatively assess value and buy well below fair value, some event will usually come along to send the stock price back up. Some of the most frequent are liquidations, promising news coming out about the company, or a sale of the entire business. How do you know the stock won’t keep dropping in price? You don’t, but if you assessed the company’s value concervatively, the stock becomes a better and better buy as it falls further in price. If I double check my analysis and see that nothing much has changed regarding the firm’s underlying value, I may invest more at the new cheaper price. After all, buying at a bigger discount reduces my risk and sets up bigger returns. What strategies should you use to get started? This is up to you, but you should probably start with Ben Graham’s final investment strategy on The Broken Leg. Not only was he the intellectual founder of value investing and achieved an outstanding record himself, almost everybody with a great record owes their success to his thought and teachings — even the legendary Warren Buffett. Earning exceptional investment returns over the course of your life is not hard, but it does take the right approach and a solid strategy. So, start exploring. You owe it to yourself to dive deeper down the deep value rabbit hole. 30-Day Challenge Review! Is it reliable trading system? Can You Really Make Him Commit?